Emily came over. We got cheap tacos from Del Taco. I love my Del Taco taco tuesday tacos. I may have eaten 9. It wasn't my fault though. It was Emily's. She thought she wanted more tacos then she did and I was forced to eat everything she didn't eat because we can't be wasting food, ya know? I spent the rest of the night reading all of my Bae Watch Logs to Emily. Then I showed her my Thirty Day Bae application. I feel much better about my logs being posted publicly knowing that Emily has seen them. She seemed to be cool with what I had written. She definitely knows where I stand on everything at this point. I think later this week she is going to read me her logs. She didn't have access to all her logs tonight, so that's why we didn't go over hers. I also shared with her my feelings about continuing this relationship. No conclusions were reached. Unfortunately, I spent most of the time talking about myself since I was the one sharing my logs with her. I get the sense that we have had similar feelings throughout this entire process. Seven. Today felt comfortable and natural. I loved sharing everything I have been feeling over the last few weeks. Eight. Things are feeling good. I felt really good about tonight. This morning at work I sent a work thing to Jake that was a bit of mess. I told him for every typo he found, I'd buy him one taco. He performed well. Del Taco took my money. As this thing is winding down and we're getting ready to post our logs, he wanted me to take a look at his to make sure I was comfortable with everything he wrote (classy man. he's just so awesome). So, we sat down and reviewed his take on the last 25 days. That was such a cool thing to do together. It was fun to read about his perspective of how things have unfolded. It helped me get a better idea of what he's been experiencing throughout this thing, what he's learned, and how he sees things between us. While I know he also has uncertainty on his end, his positivity and seeing how much we've grown together made me feel really great. I feel like my optimism was kicked up a notch. We got talking about how it's still weird that we haven't talked about what's going to happen. His roommates were about 10 feet away, so we had a very quick and very quiet mini DTR. I really need to confirm that he interpreted that conversation the same way, but I feel good about giving this some more time. I'm really impressed with how he's able to articulate what he's learned in such a clear and thoughtful way. Seriously, he is such a cool person. I'm blown away with he manages to be so kind, level-headed, funny, and introspective at the same time. 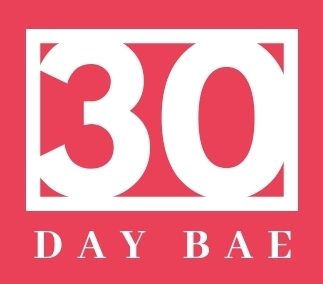 We also read one another's applications for 30 Day Bae. I think we both learned a few things about what a good relationship looks like for the other person and how we see ourselves (or at least how we saw ourselves then. There’s a few things I’d probably change on my application). Not many couples get to read this kind of stuff. It's PRETTY cool. I think we're going to go through my logs on Thursday.... so we'll see how that goes. I'm a tad nervous because I think I’ve had more freakout moments than him, but I think it should be good. He thinks he's pretty good at cards. A rematch is coming, JBae. Eight I struggle with these rating things because I'm not sure I'd know what a 10 looks like if it hit me in the face. But today was great. I'm having one of those days where I'm profoundly grateful that I was matched up with Jake. He's an awesome person and bae and boyfriend..
Brian and Sarah. Day 26.